While experiencing musical tributes or viewing a nostalgic tribute band, I always have to wonder if the performance will live up to the original performer or group. Experiencing “The Australian Bee Gees Show” at Chicago’s Broadway Playhouse at Water Tower Place, I have to say that this show does not disappoint. This musical tribute to the Bee Gees and Barry, Robin and Maurice Gibb, surpassed my expectations for a great night of music’ and a smart, respectful duplication of the Gibb brothers fabulous 40 year musical journey. Looking at the audience members dancing from their seats and singing along; I would have to say that “The Australian Bee Gees Show” delivered in every possible way. Together for over 17 years, “The Australian Bee Gees Show” has mastered the look, sound and personality of the beloved trio. This performance captures state of the art sound, camera images, and vivid graphics that brings the performance and the audience to life. “The Australian Bee Gees Show” takes a nostalgic trip through the legacy of the Bee Gees while celebrating the Gibb brothers many years of music. The 2 hour show traveled back through time was illustrated off large on stage video screens. The videos showed the moments of history moving back through time to the mid-1960s. The beginning of the Bee Gees professional career in 1968 began with their songs (I Gotta Send a Message to You, Massachusetts, To Love Somebody, and I Started a Joke). The group continued the journey forward to the 1970’s and the beginning of Disco era where “Saturday Night Fever” made the Bee Gees famous including favorites, (If I Can’t Have You, Night Fever, Staying Alive, Blaming the Nights on Broadway, and More than a Woman). The musical journey continued to 1989 where the group sang the songs that were composed by the Bee Gees that were made famous by the talents of Barbra Streisand, Dolly Parton, Kenny Rogers, and Dionne Warwick including (Guilty, Islands of the Stream, and Heartbreaker). The last act took place in 1999 where the Bee Gees performed a one night concert in Australia where the favorites included, (I Don’t Want to Be Alone, Someday You and I Should be the One, and Run to Me) This was followed by a standing ovation and encores which included (Nobody Gets to Heaven, Where Would I be Without my Woman) and my favorite, “How can You Mend A Broken Heart”. The audience was invited to sing and dance along, and everyone did. 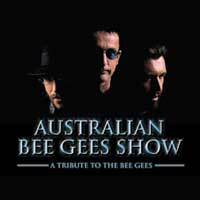 The talented musicians who play the Bee Gees are Matt Bedoni from Grass Valley California, as Barry; Paul Lines, from Shepperton Victoria, Australia as Robin; and Jack Leftley, from Adelaide, South Australia, as Maurice. All three musicians have extensive experience in the music industry. It was amazing to see their interaction and excellent blending to bring this performance to life. Particularly, since one member is from the USA, and two are from the Bee Gees’ land of Australia; their tight collaboration was evident throughout their performance. Both Jack Leftley and Paul lines began as band members in elementary and high school. Their experience has continued to grow with performing tributes to famous musicians, and to work with various artists as vocalists and instrumentalists. Matt Bedoni has a BA in classical Guitar from the University of Southern California. Matt’s experience and education has brought him to playing for Frankie Valli and the Four Seasons, Melissa Manchester, Il Divo, Jeffrey Osborne and many more. The three talented artists managed not only to duplicate the talents of the Bee Gees, but managed to have their voices trained to their original sound. Their distinct harmonies and characteristics really made you feel as though you were listening to the original group. Matt Bedoni, (Barry) and Paul Lines, (Robin) really looked and sounded the parts of the originals. I needed a little more convincing with Jack Leftley, (Maurice). However Jack was successful bringing out Maurice’s personality and recreated his sense of humor as the show progressed. None the less all three artists were musically sound and were very convincing acting as the originals. Although, I will have to say that as I was watching “The Australian Bee Gees Show”, I got to thinking how incredibly sad it is that Robin and Maurice are no longer with us. However, it is refreshing that their talent and legacy will live on forever with their music. Tribute shows such as “The Australian Bee Gees Show” will continue their legacy. Barry Gibb continues to compose for many famous artists and continues to create his own living legacy. The band consisting of Mario Basner on drums, David Inamine on bass guitar, Damion Puluse on guitar and vocals, and Pete Sprague on keyboard and vocals provided an excellent background adding to recreate the Bee Gees sound. Annerin Productions and co-producer SPI Entertainment who brought The Beatles tribute “The Rain, Let it Be”, Jason Bonham’s “Led Zepplin Experience”, and “The Pink Floyd Experience” to Las Vegas, has produced “The Australian Bee Gees Show” has brought to the show to Chicago during its world-wide tour.. This show is highly recommended. It is very entertaining and enjoyable for the entire family. This show and the Bee Gees music brought back so many great memories of my younger days. By looking at the dancing in the audience, the older generation really knows how to boogie. That is no “Jive Talking”!